Make It Handmade: How to Thread Your Serger Out of Order! How to Thread Your Serger Out of Order! This is a little 'bonus tutorial' in our serger series. We've all been there with our sergers-- it's late at night, you are tired, and you just need to finish that last seam on you serger. And then, your lower looper thread breaks. You know, the looper that you hate to thread! It's so tempting to to try and rethread only that looper instead of redoing everything. So you do. The serger seems to work at first, but after a few stitches, all you have is a tangled mess. Why does this happen? How does it know that it was threaded out of order? 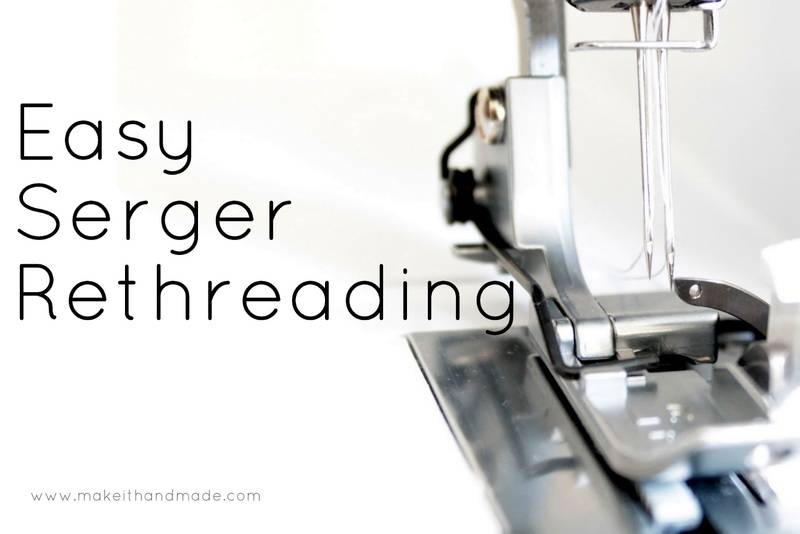 Click to go to the Threading Serger Out of Order Tutorial! Can't see it? Here is another picture with black thread where I've removed the presser foot. Sweep your needle threads out of the way before and after threading your lower looper. Run a pin or use your tweezers to get those threads free of the throat plate. My favorite thing to use for this is a toothpick. Then thread your loopers as usual; making sure that your lower looper thread goes over your upper looper thread. You can reference the Serger Threading post if you need help with this part. Since you'll have to turn your hand wheel to thread the lower looper, double check to make sure those needle threads are free. If not, use your tweezers or toothpick to sweep them out of the way again before serging! And you are ready to go-- all without rethreading your needles! I'll meet you back here on Wednesday for the next post in our Relationship Rescue: You and Your Serger post. If you have any questions, or need any help please leave a comment below, or email me using the contact page. If this was helpful to you consider becoming a subscriber to Make It Handmade! You can Subscribe (using RSS), Sign up for Emails, or Follow using Blogger! Awesome and very helpful tutorial. It was right on time as i was having this exact problem and didn't realize it was because i was thread the machine out of order. Lesson learned! Many many thanks. Please keep the serger tutorials coming. I'm so glad this post was timely for you! Thanks for the comment. I am new to serging and just had this very problem last week. I wish I would have had this post then - it would have saved me hours of troubleshooting. Thank you for all of your serger posts! Kelly, I often find the answer to my problems a few days late! I hope this will help you for next time! Thank you so much for these tutorials. I haven't sewn in a few years but I've started again so I dug out my serger and realized I've forgotten everything I ever knew about using it. You've reminded me of how much fun a serger can be and that I don't have to limit myself to my sewing machine. I guess I must be just a little confused, but after you thread the surger what do you do with the 4 threads? The needle threads are pulled to the back of the machine right? Then where do you pull the upper and lower loopers? I'm guessing to the left side?Is this where you have the lower looper over the upper looper thread? Anonymous, I pull the looper threads to the back as well. Basically, I can grab all 4 threads and pull them towards the back of the machine! I hope that helps! Hi Palak! Just poppped over tonight to double check the re-threading instructions you posted. They're super helpful--I always forget which looper thread goes on top. You saved me a ton of time because it worked on the first try--thank you, thank you! What a life saver! I was rethreading for hours the lower looper, if only I had known that I needed to cut and rethread the needle too. You are a saint! This is so helpful! I'm going to have to read all your other serger posts too. Thank you!! Thanks that's very helpful. Logically it didn't make sense to me that I would have to rethread the needles because the path for the needle threads is no where near the paths for the looper threads. You're "trick" makes perfect sense. Why, oh why, have I not found you sooner??? I have spent hours pulling my hair out over this one little problem. What a Godsend you are!! Thank you for your Serging helps! I went crazy trying to thread the lower looper. Finally my husband took over and somehow did it correctly! Now we know why! Thank you! Thank you! Thank you! Twenty minutes rethreading before I turned to google and found the solution first go!